After more than 80 years in service, the Hoboken Horni was finally taken down from the corner of Washington St. and 1st St. in 2018. The signal collecting community was keenly interested in the fate of this rare, classic traffic light. 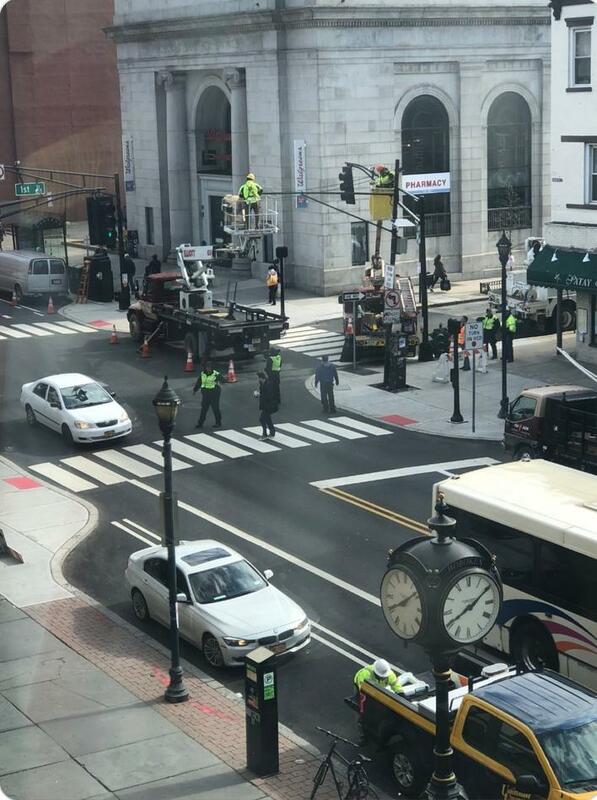 As soon as he knew of Hoboken’s plan to refurbish Washington Street, Chris McNally (a dedicated volunteer at the Baltimore Streetcar Museum) contacted the city in the hope of working out a plan to preserve the signal. He got the attention of some historic minded people in the city government and ultimately got the Hoboken Historical Museum on board with saving the light. Chris, Randy Trezak (a.k.a., 3liteguy), Mike Natale, and this webmaster installed the light in the museum on October 20, 2018. Thanks goes out to the kind people at the museum, especially Bob Foster, for graciously making this possible, and for understanding and even sharing in some of our giddy excitement over the project. We even got a nice little gift from them! Chris finally meets his old pal. The glass was in great shape, but covered in decades of soot. Just a quick cleaning made a huge difference. We replaced all of the feed and interconnecting wires, and put shrink tubing over the socket wiring. The feed wires were a disaster…amazing this light was still functioning on the street like this! This signal probably weighs upwards of 200 pounds. Getting it hung from the museum ceiling was a challenge that had some tense moments. Randy did a masterful job as we helped from below, but mostly just watched in awe. Randy sets up the span wire. Mike holds the behemoth at an angle for a while. I forgot why we needed to do that. It was a long day, but one I’ll never forget. I look forward to walking the waterfront in Hoboken again soon and stopping by to see the museum. You should too!